Super Hero Boy: One piece of clothing that will last you from newborn to teenager.. no joke! One piece of clothing that will last you from newborn to teenager.. no joke! When new mom's ask me what is the most important piece of clothing to buy in a newborns layette my overenthusiastic answer is always BabyLegs. Seriously.. there are endless ways to use them and they can be worn from newborn all the way to adults.. If you can only buy one pair buy a pair you really really love and will go with as many outfits as possible as believe me you will use them almost as often as diapers! In summer months BabyLegs are a great alternative to pants or even shorts as they protect those precious knees and legs in crawling without overheating your baby and nothing is cuter than a baby in a simple solid colored onesie and a pair of brightly stripped BabyLegs! We just moved to the deep south this fall from up north and our first winter here was very mild so it was not uncommon to end up one day in shorts and the next day in pants.. in the end I gave up on pants all together and on the cooler days I just slipped on a pair of BabyLegs under Connor's shorts or rompers and forgot about the pants all together. You can do the exact same thing with short sleeves as well and put them on their arms instead of legs! BabyLegs are truely the one size fits most garment.. on newborns they pretty much fit from the very tops of the legs all the way down to the ankles and as your child grows they will still fit on their legs (well into childhood) the length just get shorter as they grow.. Currently Connor's baby Legs fit from about mid thigh all the way down to his ankles easily. They also make great arm warmers for children and adults. I actually have worn Connor's BabyLegs on more than one occasion on my arms instead of bringing a jacket with me as I always have a pair or two of BabyLegs in my diaper bag if I even suspect it may get chilly. 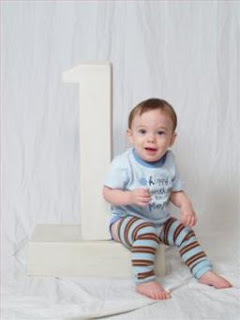 Check out Connor wearing a pair of his BabyLegs in his one year pictures see how far they still fit up on his little fat thighs!! BabyLegs now come in organic styles as well! Baby Legs provided us with a pair of Organic "Mini Pools" BabyLegs to give away to one lucky reader! Leave a comment on this post. Check out BabyLegs and tell us which style is your favorite other than the Mini Pools design. This contest will end June 4th at midnight! I love the jolly jill BabyLegs! My husband has somehow been honored with the nickname "Pirate" by his friends and so of course our unborn child has been given some very sweet & creative nicknames. I know my husband would just love these! I love baby legs and they are perfect forever. Love, love, love them. I like the cow looking ones. They're adorable. Thanks. Sorry if you get this twice. Blogger is being stupid. My favorite is Marzipan. It's fun and funky! I've got ya added to my sidebar! I think the giraffe ones are really cute! i like the modish. i keep hearing bout these !!! I've heard a lot about these babyLegs but actually haven't bought one yet. I would love to win a pair. My other favorite pair is Petunia. Thanks for the giveaway. I like O Rose the best of course, one is really hard to choose! I like the Jack and the Jill Gift set . The polka dots and the stripes are just too cute in muted shades of blues and pinks. I love Babylegs. I love the pumpkin colored baby legs - they would be so cute for fall!! Thanks for the giveaway! I love the Organic O Rose design. Great giveaway, thanks! I like the Wellesly design. Thanks so much for the opportunity. I am actually first, I love the Stone Crop design! You are also on my sidebar for extra credit on my Blog: The Mama Hoods Goods. Thanks! Blue Bubbles (I have that one already and also the cute green stripe ones in the top picture). I love these things (and I have 2 boys, no girls). I give them out as baby gifts when I have the opportunity as they are original but still so functional. My 3-yr olds still wear theirs from time to time but the 1 yr to 2 yr range they were in them all the time. The brown/pink in the Modish design are so cute! I wish I'd known about these when my daughter started to crawl, her sensitive little skin always got rashes from carpet and rugs. Baby legs would've been a good solution! I like the Rose print baby legs! Your on my bloggy sidebar for an extra credit! We are also subscribed to your feed via e-mail! Giraffe is my favorite. Hands down as we are big zoo goers. Those are SO cute! I love lime drop, pink polka dot, bumblebee, Phinney, etc., etc., etc. I really like the super soft "Spice"
pair. Thanks for a fun contest. I like the La Mer. I have heard so many good things about these. I would love to try them. I really like blue bubbles. anyone who stumbles across my blog can find you! I love babylegs...and they're not just for babies. My daughters are 2 & 4 and both just love them. I'd love to get DARK RYE as our next pair. Thanks for the chance to win! I love the bones or the Jolly Jills! they are all so cute! I love the blue bubbles, flames, and the jolly jack. I couldn't choose. If I had to I'd pick the blue bubbles. I love the organic o tulip. Love the Banana Blue in the Retro category! I always liked the Mod design, the one with blue and brown. I like the natural organic cotton! I like the Purple Retroo baby legs! Very cool! Great knee saver on hard wood floors! I love the natural organic cotton. Also, the ivy league. I like popsicle and jolly jack. I love the supersoft spice in "a little longer" since my husband is 6'6" and my daughter is freakishly tall for 3, Im assuming this baby due in August is going to be too!! Oh, I like the marzipan pair. How fun. I like the Jolly Jill ones. the giraffe ones are cute. We didn't have these when I was raising my babies. It is great to see them available for my grandchildren. There is no way to just pick one but here are my favorites: huckleberry, spice, popsicle, sorbet, bluebell, vine, curry and lite. All of the patterns available are just wonderful! They have so many cute styles, it is hard to choose a favorite. I think I like the Tickled Pink pair the best. I love these and have been wanting a pair forever! I would love to win them!! I love the huckleberry but it was a very hard choice. I like the Mossy design. Since my granddaughter has skin problems I love the supersoft lollipop. But also the sorbet! I really like the O Rose-so cute! I like the brown and blue strip and the Jolly Jack Pirate the best. So cool. I love love love Baby legs! It's an addiction! Theres so many cute ones... my fav are the sorbet! My favorite ones are the Cabana Blue. Mossy is my favorite pattern. love the Pink Ribbed classic !!!! I like the Phinney design. I think the Marzipan is really neat. Reminds me of the tights my european siste-in-law puts on her daughter. What a sweet idea! I love them all :) I do like the SuperSoft Lollipop 40cm. Those would be great for my niece. Thanks for entering me! argyle is nice and classy! Gosh I really need to buy some of these! I would probably choose the classic Pink Ribbed because they would go with everything. Marzipan is my favorite style. I love the colors in it. I love the Rainbow ones. Thanks! My favorite design is the jolly jack design and I also like the supersoft one in the flame design. I love the O Rose style--along with a dozen others! I love the O Tulip and Vines ones! They are so much fun, and yay, organic!! Thanks, my kids have lived in these growing up! I like the Wellesly design. They are all great! I have a few pairs, I would take a pair of Earth BLs. I love the hearts! It reminds me of the 80's. phinney is so cute. Seriously, it doesn't get much better than chubby baby legs in a pair of baby legs! They're simple and unisex, and would still look fresh in several years. I like the Mossy Organic Baby Legs! I love the Jolly Jack design! I like Brite a lot - not too babyish! I really love the Organic Marzipan, and I have like 15 other favorites too! It is so hard to decide on just one. I guess I would pick the Neapolitan. Those are so cute. I love Jolly Jack and Jolly Jill! The Heron are super cute! I like the super soft spice. great colors! I like the Butterscotch Plaid! I would love to win a pair of these! I really like the retro blue bubble style. i love the jolly jacks, but these are cute, too! I want to get a pair of the white ribbed ones. My favorites that we have are Brown with polka dots. The jolly jack and all the funky ones would be so cute on my little guy. love the organic snorkel ones! Gotta say the Jolly Jack, but I also like Rainbow. i love the flames! so fun! I've always wanted to try these on my daughter! I like the Cayenne stripes. I like the Jill Stripe! I like the Organic Stone Crop best! I love the colors in Marzipan! So cute! I love this product! I think Mossy is my favorite. Thanks for the contest! We love the SuperSoft Lollipop 40cm baby legs. My daughter loves to put socks on her hands and I have a feeling she will just adore these. I love the Cayenne color (Retro). I think the 'bones' design is really cute! My daughter just loves skulls. so the Jolly Jill would be perfect for her. The organic Heron is my favorite. Thanks katie_mmartin at yahoo dot com. I love baby legs- especially now that they come in organic! I love the Heron ones the best, I think, but it's hard to choose! I like the phinney. So cute and they look really useful. I love the anemone style. Fresh! I like "sorbet"...the pattern & the dessert! :) I luv BabyLegs. I like LA MER. I have a knee walker, so I LOVE these!! I love the juniper ones! So cute! I'm going to have to order my son some soon. I really love the Spice BabyLegs! I really like the Retro in Purple Bandana. These would be PERFECT. Our 15m old has really really bad food allergies, which iritates his eczema. It is horrible! This would be so much more styleish than pants all the time, even in the summer! We like the Orange/Aqua ones! I like the modish design. I love the flame baby legs! I really like the giraffe baby legs. They are so cute! The Wellesly is super cute! I'm a big fan of the new Petunia BabyLegs. I like the neopolitan baby legs. Lets hear it for the spice baby legs; remind me of the Spice Girls!!!!!! Ha!!! I love the Cabana and Pretty in Pink gift sets. I love the Sorbet, perfect for my little sweeties! giraffe baby legs are so cute. I Lurve me some babylegs! Neapolitan are so pretty! I like the SuperSoft Flame 40cm. I love this idea. I love the red and black stripped. It would be great with the new Emily Strange onesie I just bought my daughter. I like the USA flag design. Oh I would love to win a pair of Babylegs! :) Love Neopolitan! I'm subs to your feeds! The bones babylegs are my favorites. I like pretty much all of them but marzipan is my favorite. My baby girl looks great in the Jolly Jack - they're my current fave! I love the Cow design!